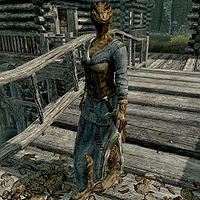 Wujeeta is an Argonian citizen who works at the Riften Fishery. When first spoken to, she requests your help in overcoming a skooma addiction, for which she simply requires a healing potion. Inquiring further about her skooma dealer results in her providing the information required to start The Raid. She wakes at 6am and starts her job at the city docks until 9am, when she heads inside the Riften Fishery building and works there for six hours. At 3pm, she resumes fishing outside at the docks for another three hours, ending her workday at 6pm. She spends the rest of the evening at Haelga's Bunkhouse, going to bed at midnight. Wujeeta wears a set of farm clothes along with a pair of boots. She carries a belted tunic, a purchase agreement and a selection of common items and gold. In combat, she relies on a leveled dagger which can be up to elven in quality. Should you come across her, she will remark, "You have no idea what it's like to have everything, then watch it all disappear." If you have not helped her with her addiction, she will worry about her job: "What am I going to do?" or "Oh, my aching head. Why do I do this to myself?" She will also notice you and plead, "Please help me, I'm going to lose my job at the Riften Fishery." or "I really need your help! I don't want to lose my job at the fishery! What am I going to do?" During the quest Spread the Love, you may hand a pamphlet to her, though she will respond with scorn: "I wouldn't even clean my tail with this trash." If Bolli is alive, you may ask Wujeeta if she likes working at the fishery. She will say, "Bolli is a good man, he pays us well and watches out for us." and tell you about her previous job: "I used to work at the Black-Briar Meadery, but Indaryn and I never saw eye-to-eye. That elf has no patience at all. It's probably for the best anyway; I'm far better at fishing than working in a meadery." When asked about losing her job, she will confide her fears to you: "My job at the Riften Fishery is in danger. The owner, Bolli, said that if I show up for work in this condition one more time, then I'm out. I don't mean to do this to myself, but I can't help it. I tried some skooma a year ago, and ever since then, I can't stop!" She will go on to suggest, "If you could give me a healing potion, I could cleanse this poison from my body and get back to my life." Refusing will have her reply, "Very well. I suppose I'll just curl up somewhere until this passes as usual." though you can change your mind. When you hand the potion straight away, she will be grateful: "Your kindness will never be forgotten. Here, take this. It's all I can offer for what you've given me." If you don't have a potion with you, you can still promise to get one for her, to which she will say, "Thank you, my friend." As the two of you part ways, she will add, "Any healing potion will do. Please hurry." When you come back to her, she will ask, "Did you bring anything? The pain..." Give her the potion, and she will respond, "Thank you. I'd almost given up hope. Here, take this. It's all I can offer for what you've given me." Either way, once she has what she needs, she will thank you with a leveled, unenchanted ring. She may also tell you, "You've been kind, I thank you." or "I'm feeling much better now thanks to you." as you bid her farewell. "It's not worth dying over." "It's got nothing to do with the coin... this is my life we're talking about." "You can't threaten me any worse than they have!" On the other hand, once you succeed, she will finally spill the beans: "Okay, okay, I'll tell you. I get my skooma from Sarthis Idren. He has some sort of a setup over at the Riften Warehouse. You can't get inside though. They've kept that place locked up tight since the war began." She will also inform you about the key to the warehouse: "I overheard Bolli say that only the Jarl carries the key to the warehouse. When I meet Sarthis there, he's usually waiting for me outside with his bodyguard." Before you report this to the jarl, you can further ask Wujeeta what she'll do now. She will answer, "If it wasn't for skooma, I'd already be on my way out of this horrible city. All my gold... completely gone. Now I have to start over. I'll never use skooma again!" and end by musing, "Although I suppose a little mead now and then would be harmless..."
Once Sarthis has been dispatched, your next task will be to deal with a skooma operation. Should you meet Wujeeta before you complete your mission, she will once again express her gratitude: "I thank you for your help, my friend." If you have not gone to the skooma dealers in Cragslane Cavern, she will also caution, "Be careful, Niluva is a bit... aggressive when she's cornered." Bolli: "Wujeeta, we need to talk." Wujeeta: "I know, I was late. I'm sorry." Bolli: "I don't know what I'm going to do with you. I can't just let this go unpunished." Wujeeta: "Please, don't get rid of me! I need the coin. I... I'll work for free for the rest of this week. Please!" Bolli: "Sigh. Very well. You're lucky Maramal has placed me in a very forgiving mood." Valindor: "Wujeeta, you really need to stop using that skooma. It's very bad for your health and I wouldn't want to see anything happen to you." Wujeeta: "I can't, Valindor. It won't let me go. It's taking over my life." Valindor: "It's an evil substance. Whoever's selling it to you should be brought to justice." Wujeeta: "If there was any justice in the world, I'd just get this over with and die peacefully." Wujeeta is not essential, and if she dies before completing The Raid, you will never be able to become Thane of the Rift. This page was last modified on 2 September 2014, at 17:51.